HAMMR was formed in Cleveland, Ohio by J. Hammer in 2013. As a strictly solo endeavor, HAMMR recorded a full digital-only demos album, which caught the attention of several labels. From there, the band went on to release the Hammr EP in 2015, first digitally and then on cassette tape through Hota Rex, the latter of which quickly sold out. Categories: CD-Distribution, DISTRIBUTION, DISTRO STORE. Tags: Black Metal, Hells Headbangers ‎, Speed Metal. Other plans for releases were delayed due to label managers going to jail as well as the usual financial delays, which led J. Hammer to start releasing demo singles directly to the metal people. It was during this time that he met the folks behind HELLS HEADBANGERS and also DEMONA founder Tanza Speed, who both took a lot of interest in HAMMR. Once he received the offer, J. 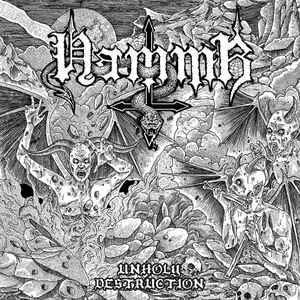 Hammer decided to hold off on recordings for other labels, and use some of his demos and new material for the imminent debut album, Unholy Destruction.